One day Han Alister catches three young wizard setting fire to the sacred mountain of Hanalea. Han takes an amulet away from Micah Bayar, son of the High Wizard, to ensure the boy won't use it against him. The amulet once belonged to the Demon King, who nearly destroyed the world a millennium ago. With a magical piece so powerful at stake, Han knows that the Bayars will stop at nothing to get it back. Meanwhile, Princess Raisa ana'Marianna has her own battle to fight. She's just returned to court after three years of riding and hunting with her father's family. Raia aspires to be like Hanalea, the legendary warrior queen who killed the Demon King and saved the world. But it seems that her mother has other plans for her-plans that include a suitor who goes against everything the Queendom stands for. 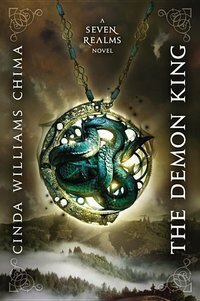 The Seven Realms will tremble when the lives of Han and Raisa collide in this stunning page-turner from best-selling author Cinda Williams Chima.